I have theeee most refreshing cocktail for you today! Fresh cherry vodka sodas, coming right up. They are perfect and refreshing in this hot hot hot summer and just maaaaybe if your air conditioning breaks and it ends up being 93 degrees inside your house, they will cure all. Maybe. The verdict is still out. Ugh that’s a thing that’s happens. But we have cherry vodka sodas. Or shall I say that I have cherry vodka sodas. And need many, many more. I get ridiculously excited for cherry season every year. You know this! And I went back and forth on cocktails this week. Should I make a fresh cherry bourbon smash? Which is sort of overdone and even though it’s a favorite of mine, reminds me more of a warming, fall-like cocktail. Right? OR. A fresh cherry vodka soda. Which sounded amazingly refreshing and delicious for a hot, sunny summer day – much like this fresh cucumber vodka soda. Sitting by the pool and sipping one of those? I’m into it. With some lime, for that whole cherry limemade feel? The first step is to make a slightly sweetened, fresh cherry syrup that we’re going to puree. 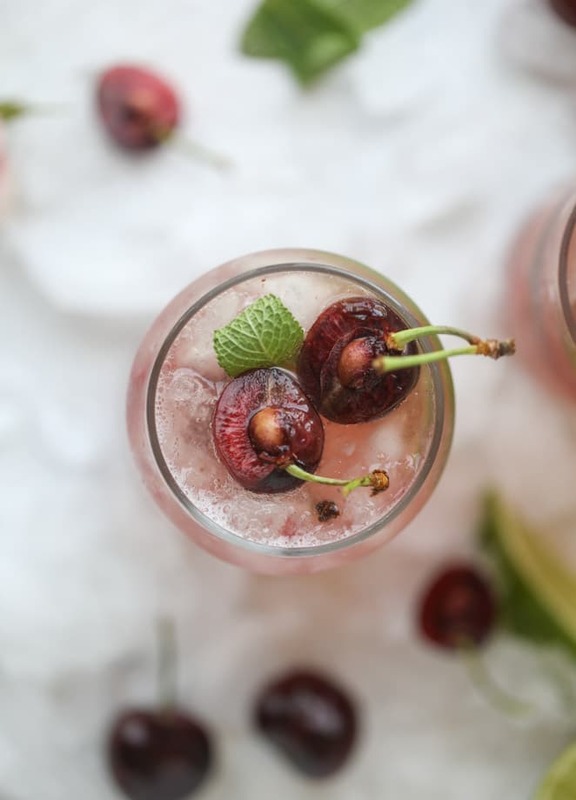 And the best part is that it’s pretty thick – a wonderfully fresh and hearty cherry syrup – one that isn’t strained because all those cherry pieces get blitzed in the blender! I threw a bit of sugar and water in the saucepan with a ton of fresh cherries and warmed them until they were bursting. Basically wanted to take a spoon to that saucepan immediately and consume the cherries that way. You can keep this to a cherry vodka soda or you can go one extra step and make a LIME cherry vodka soda. The flavor. The freshness. The refreshing-ness! Which isn’t a word at all but, you know. It’s dreamy. It’s a little hint of margarita meets vodka soda. And it’s light. Not overwhelming in flavor or booze. Practically tastes like juice and bubbles. It’s also super pretty! And reeeeally easy to make in a pitcher and serve to a bunch of friends for happy hour tomorrow night. Or Saturday afternoon. Or sunday funday! I know that I’ve been reeeeeally into sangria this year, but a cool, fresh soda cocktail like this? New FAVE! In a large pitcher, combine the lime juice, vodka and cherry syrup. Stir well then refrigerate for at least 1 hour. Before serving, pour in the cold seltzer water. Taste and if desired, add in more simple syrup and seltzer. Pour the mixture over crushed ice and garnish with lime wedges, cherries and fresh mint! Place the cherries, water and sugar in a saucepan. Heat over medium-low heat, until the cherries are soft and bursting, about 6 to 8 minutes. Carefully pour the mixture into a blender and place a towel on top of the lid in case any of the hot liquid escapes! Blend until the cherries are pureed and the mixture is combined. This tastes like an icy, fizzy grown up soda. I LOVE IT. Hey Jessica, this drink looks amazing!! Just what I need tonight 😍 would this work well with frozen cherries? I don’t have access to fresh until later in the summer. i definitely think it will! i love to use frozen too! So this is my laaaaaazy version of your beautiful drink….one lime, 1 11/2 shots of rum, tequila, vodka, whatever clear liquor you like, ice half way up your glass, and fill with Diet Cherry Sprite Zero. Very low brow? Yes. Super super delicious? Also yes. ummm hello i need that! Yes, yes, yes!!!! I cannot wait to try this! Such a fun and beautiful summer drink! We’re having guests this weekend and this is now on the list! You never cease to amaze with newer, even more delicious sounding cocktails. I’m thinking you need a cocktails-only cookbook/mixology book for us booze-loving peeps. What are those glasses? (The straight ones with kind of wavy-ish sides)? I love them! I’m outrageously pregnant at the moment, but I want this NOW. If I just leave the vodka out, do you have any adaptation suggestions? omg – this looks so good!